Hey everyone, well somewhat back to normality with Roger as he dimissed Benoit Paire 6-2 6-2 in just 54 minutes to move into the semi finals where he'll face Paul-Henri Mathieu. It was easily Roger's best match of the week, breaking twice in each set and not facing a single break point on his own serve. He served a lot better and looked way more at ease with his all court game. Paire wasn't the toughest opponent of course but it was definitely a clinical display which is good to see after the poor performance against Bellucci earlier in the week. I was very happy with the match, the way it went, I was able to mix up my game, play aggressive and take it to Benoit. He struggled after that. He didn’t have his best day I think, but maybe I pushed him there, so I’m happy with the outcome. In terms of how the match played out I don't think Roger really got tested, partly down to his own play and dictating of points and partly because Paire wasn't playing at that high a level. The big positive for me was Roger served a lot smoother, found the corners when he needed to and that usually allows him to relax on the return. If he's serving poorly then more often than not he returns poorly too, perhaps he's always thinking of the next game when that happens and can't just free up his arms. But whatever the reason that didn't happen today because he served better and that seemed to help his overall game. Couple of interesting stats from the match are Roger won 24 of his 25 first serve points, was 4 out 12 on break points converted and by winning it meant he's won 32 of his last 33 matches in Basel (lost to Djokovic in the 2009 final). Another interesting stat that I didn't know before the match was Roger is 9-1 win loss ratio in Quarter finals in Basel with his last defeat being in 1999 at the hands of Tim Henman. The writing was pretty much on the wall for Paire with that stat! Next up for Roger is Frenchman Paul-Henri Mathieu whom he leads 5-0 in the H2H with their last meeting coming at the US Open in 2010. Mathieu is pretty dangerous but he's had such an injury plagued career that he's not really achieved much in the way of titles and big wins. I watched his match against Dimitrov and he played pretty well. His backhand is dangerous but I don't think he can play against Roger like he did against Dimitrov. He spent much of the match defending, albeit well, but the fact Dimitrov is a dumb player helped his cause as he let him back into so many points. In many ways Mathieu is a lesser version of Nadal with a tad more aggression and I think that falls short against Fed. If he has to defend constantly then Roger is going wear him into the ground. His only chance is to go toe to toe but whether he can do that remains to be seen. 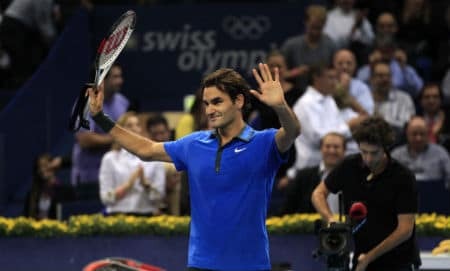 As I pointed out above the last time Roger lost a Quarter final in Basel was in 1999 against Henman, the last time he lost a semi final was in 2002 against David Nalbandian. That odds are against Mathieu so I reckon Roger is getting the job done in straights. It’s nice seeing him playing so well, he’s also had a couple tough matches here this week. He’s a good player. He’s got one of the best backhands in the world. He’s got a good fighting spirit and he’s my age, so we’ve known each other for a really long time. I’m looking forward to the match. I said in my Bellucci post that I don't think Roger is winning Basel this year, I have renewed hope after the Paire match but I'll stick to my prediction on that as it'd be wrong to change it. I still think Fed is vulnerable to an upset but there's only 2 more matches to go so his chances go up and if he can keep improving set by set then he could take the title. Allez les suisse! Nice to see Fed back in decent form. Have you seen Dimitrov’s trick shot against Troicki? I would’t say it was the shot of the century, but certainly a candidate for shot of the year. Agreed… Most people never even heard of him (including me) until 2 days ago. Do you think it’s shot of the year, beating Djokovic’s tweener and Fed’s Wimby shots? Maybe not, I agree with Husain – Federer’s inside dropshot against Murray was incredible, Dimitrov’s was incredible, but I think it was luck. Djokovic’s tweener wasn’t not that impressive, he actually deliberately slowed down when he was running backwards to hit it when he could run around the ball easily, I guess he did it for his enthusiasm. It was his drop shot that was better shot and won him the rally and I guess helped him win the match as well. I also would consider the crazy rally Federer had against Murray in Shanghai, that was way more exciting with the defense from both players and the final half volley wicked angled dropshot that just hit the line. That was a crazy rally. And it just shows that Roger doesn’t have to play well to produce crazy shots. His game was off that day, but when it clicked for that rally it really clicked. Yeah that was an epic rally in Shanghai, maybe point of the year. As for shot, I’m not sure. I just watched it now man, pretty good! Roddick played a similar one this year. Not sure on shot of the year though… could be that. Yeah that shot was immense. I think maybe a couple of volleys Fed has made this year were better. Delpo is in the final, Fed is currently in charge of Mathieu. Delpo is playing very well right now so he’ll be a very tough match for Roger but having the 6-0 edge in 2012 should help with Fed’s mentality. Fed’s in the final! Yeahhh!